The packing process took much longer then usual this morning in the cold air. When I finally left the rim at noon, I don’t think it had gotten above 45 degrees yet for the day. My main morning task was to figure out what was going on with my InReach and charge my electronics. I had struggled with that yesterday. I never found a place that was a) inside with b) an outlet and c) cell/data reception. I could only ever find some combo of the three. I had lots of time this morning because of the new itinerary I worked out with the backcountry ranger yesterday. I had a few reasons for wanting to change it. 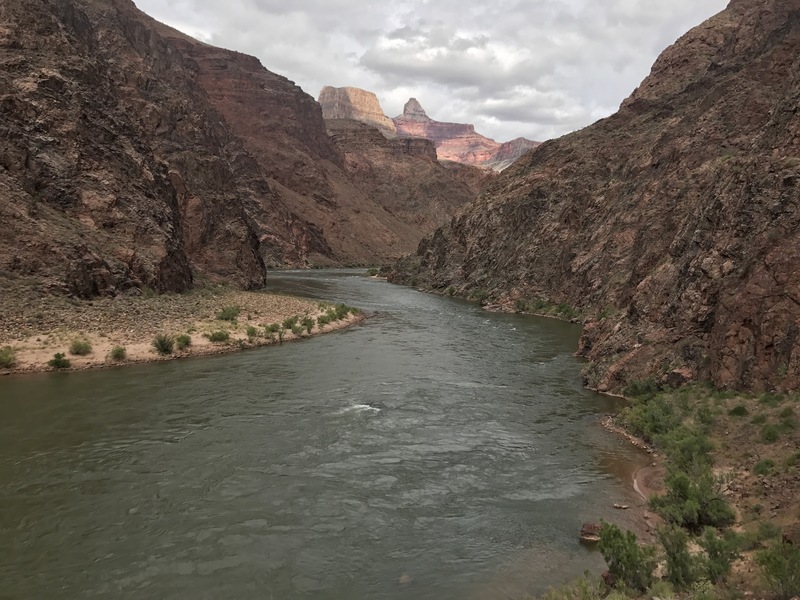 Originally I’d been planning on taking an alternate to the guidebook route that would have kept me on the Tonto Plateau for another 50 miles before dropping to the river and catching another ferry hitch back across. After these last few days on the Tonto that no longer sounded appealing. Yes, it would have been more time in the main Canyon, but there’s also something to be said for time spent in the Kaibab. One of the things I appreciate about this route is the diversity of experiences on it. A high altitude ponderosa forest is unique to this area, so while I wasn’t thrilled about a 25 mile road walk, I felt like it all balanced out. And then there was the issue of the Tapeats. A short crosscountry section of the route first goes through what is supposed to be an awful bushwhack, down some plunge pools, and then wading knee deep for a few miles through Tapeats Creek. Except Tapeats is running too high right now, and actually swept away a woman and her grandson who were trying to cross it about a month ago. So an alternate route for that was needed too. And finally, there was Brighty. Christa and I like to read bedtime stories out loud to each other, and before I left for this trip we started reading “Brighty of the Grand Canyon” by Marguarite Henry. 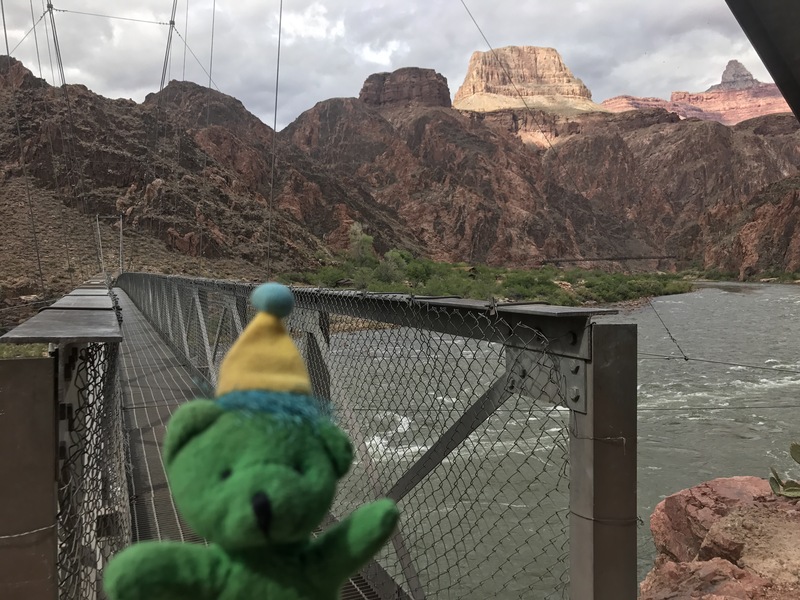 A semi-true story about a burro who lived on the north rim during the early twentieth century, gave rides down to the bottom for kids, helped Teddy Roosevelt hunt cougar, and was the first to cross the bridge across the Colorado River connecting the North and South Rims. We actually finished reading it together over FaceTime in Kanab. 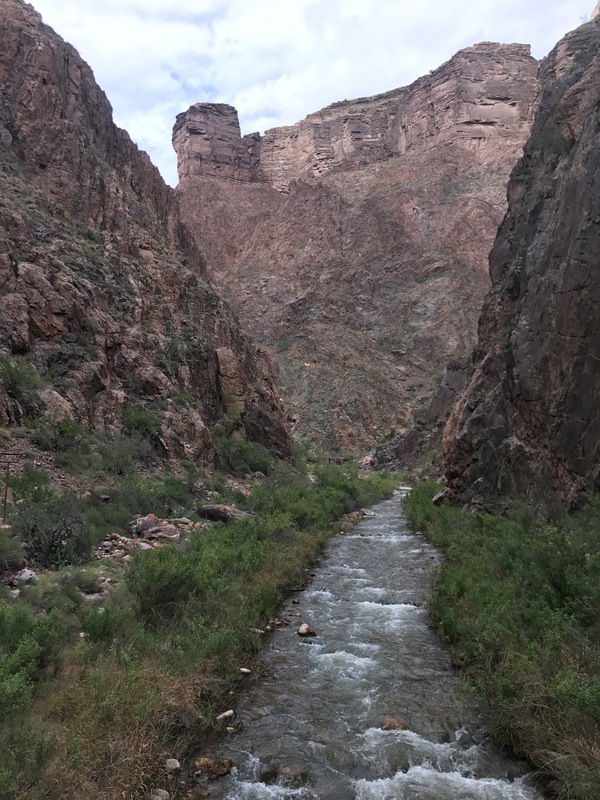 Sentimentally I wanted to hike up Bright Angel Creek. See Brighty’s terrain. Explore the meadows he grazed during the summer. See if I could spot an old mine and pretend it was Old Timers. Maybe even hike out to Uncle Jim Point if I had the extra time. It felt like I could bring Christa into a small part of the hike. Wow, that was a lot of explanation! I should get to the trail, huh? I got through to DeLorme and got the InReach working again (woo-hoo!) and was thankful to be leaving the cold south rim just after noon. Getting ready to head down the trail. I even got to catch a glimpse of one of the mule trains just arriving back from Phantom Ranch. Waiting for the mules to pass. 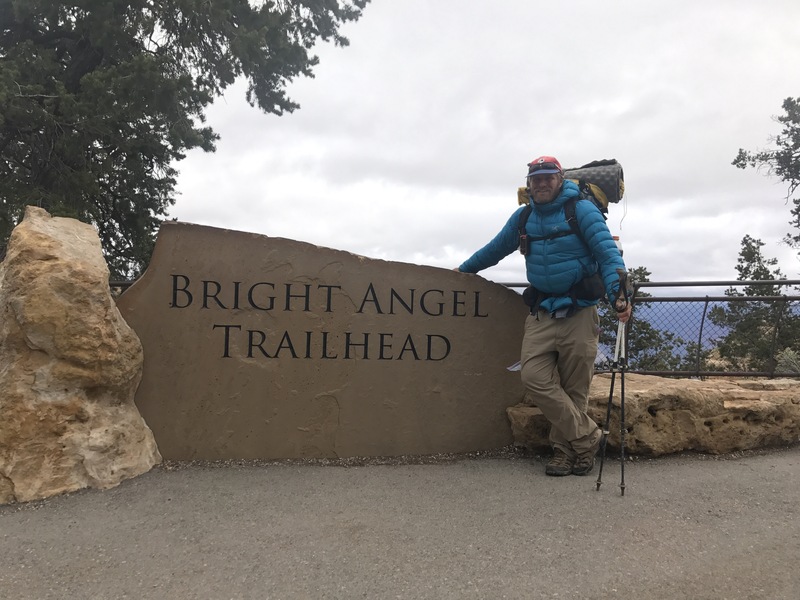 The Bright Angel trail differs from the South Kaibab Trail in a few ways- namely that it follows side canyons instead of ridge lines, but also because it has access to water. Every 1.5 miles is a fountain station to refill from. While it was chilly up on top, even just 100 feet down it felt warm enough that I no longer needed my puffy. What wild weather swings! 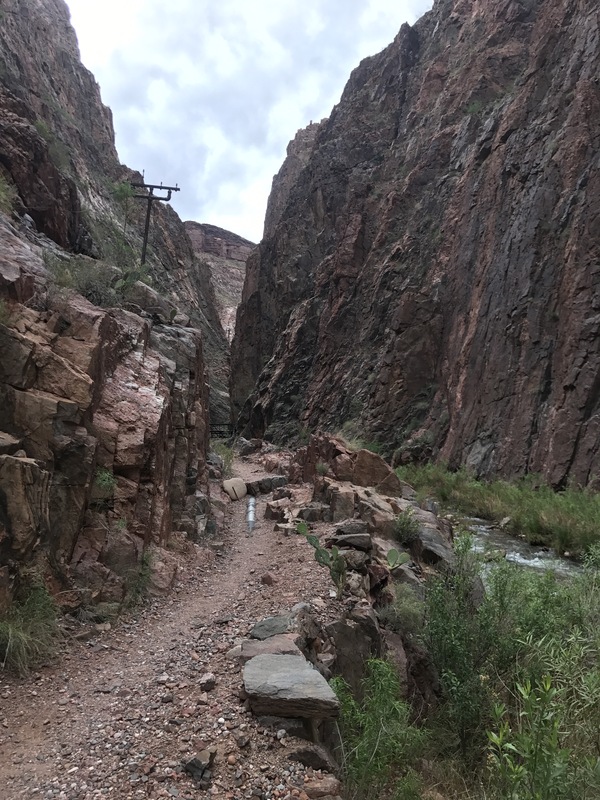 There were lots more people out on this trail than the Kaibab- even a woman sitting on the side singing with her banjo. 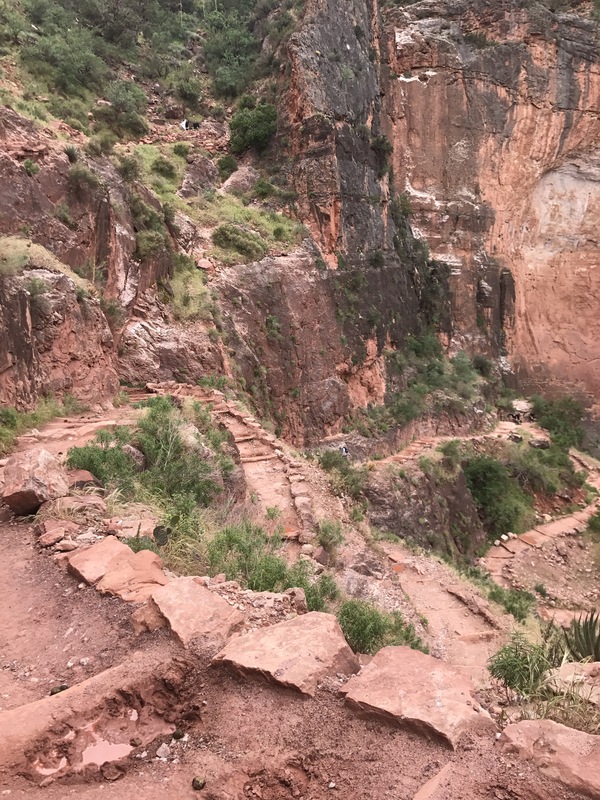 I’m still blown away by how nice these trails to the South Rim are! Even the steepest switchbacks feel almost like I’m walking on a road. At Indian Garden the trail leveled out a bit and picked up a beautiful flowing creek that we followed down the rest of the way to the river. Waterfalls along lovely Garden Creek. And the river. There’s just something about the Colorado through the main Gorge that drops my jaw every time I see it, no matter how steep the walls. It’s such an impressive sight. What drew my attention this time were the hundreds of small birds swooping back and forth across its expanse playing in the breeze and surely catching lots of insects. Back on the magical Colorado! Just after hitting the river I ran into a ranger on patrol, Della, who seemed a little skeptical when I told her my destination was Cottonwood. But fortunately I had the permit to back it up! Super thankful I went and made the official change versus trying to squeeze by. It felt good to have my permit checked and be legit. I crossed the Colorado on the silver bridge, which was built in the 60s to carry the TransCanyon pipeline across to the South Rim. The Black Bridge, while not the original swinging suspension bridge Brighty originally crossed, is in the same location about a half mile upriver. Lydia’s Geopet crossing he Silver Bridge. The older Black Bridge is visible in the background. Across the river now, I was in Brighty’s old stomping grounds on the North side. I tried to stop by the Phantom Ranch Cantina for a drink, but they were closing in 5 minutes and refused to sell me anything. 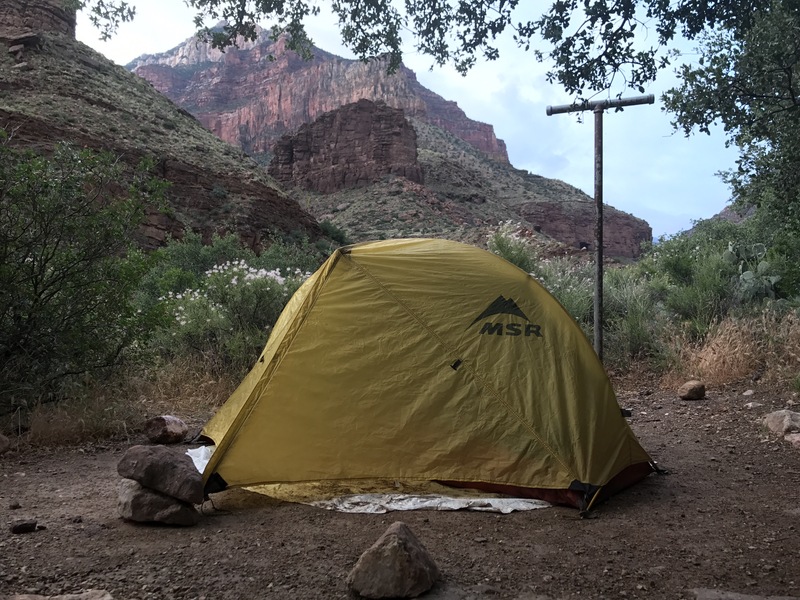 As I was getting ready to press on a guy came up to me and said “Hey, didn’t we see you going up two days ago on the Kaibab? What are you doing back down here?” It’s kinda weird and kinda cool to be recognized by strangers. And then it was time to push on. 6 miles up the trail to Cottonwood Camp. 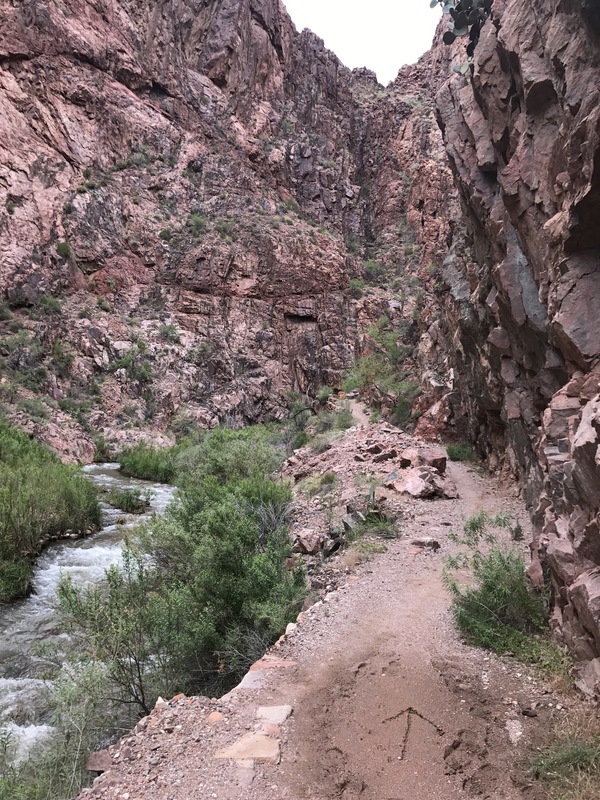 An easy almost flat stroll through the narrow section of the Bright Angel Creek. Along Bright Angel Creek imagining Brighty leading the way. As I walked the easy to follow trail, I began daydreaming. Imagining Brighty clip clopping in front of me for a bit, or splashing through the cool creek on his way to the other side where he’d jaunt up the cliffs a little ways, not satisfied with the flat trail. 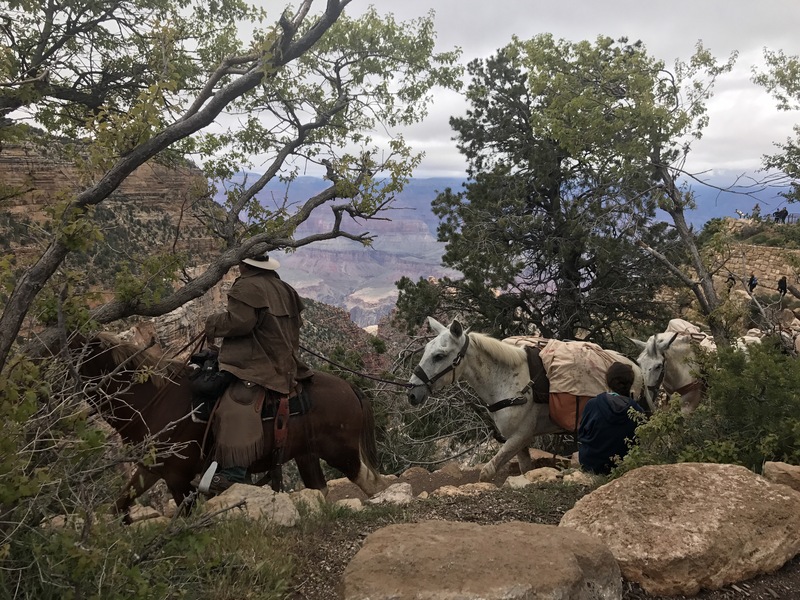 I tried to catch the whiff of Old Timer’s griddlecakes on the breeze and kept an eye turned towards the hills for a cougar that wouldn’t appear since the real life Uncle Jim hunted them to extinction in the Canyon. Out of the fantasy world, I also marveled at the modern touches we’ve added to the Canyon. 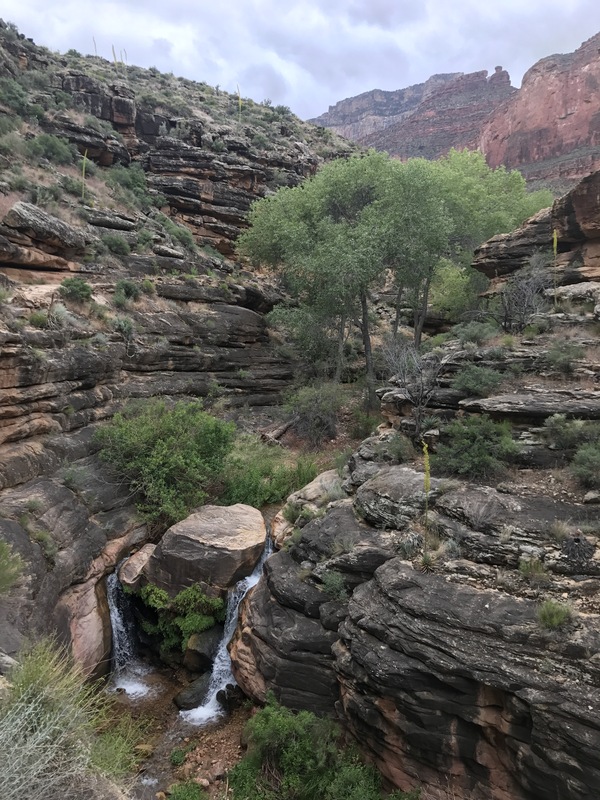 The trans canyon pipeline was built in the 60s and starts at Roaring Springs on the north side and provides all the water for the North and South Rims. And then there’s that transcanyon phone line constructed in the 1930s by the CCC. Both the transcanyon pipeline and transcanyon phoneline are visible in this photo. What awesome feats of engineering! I can’t imagine how difficult they were to build. The trail was super easy to follow, but just in case you were uncertain someone left little arrows along the way. Dirt arrows (and smiley faces in some spots) pointed the way up-canyon. 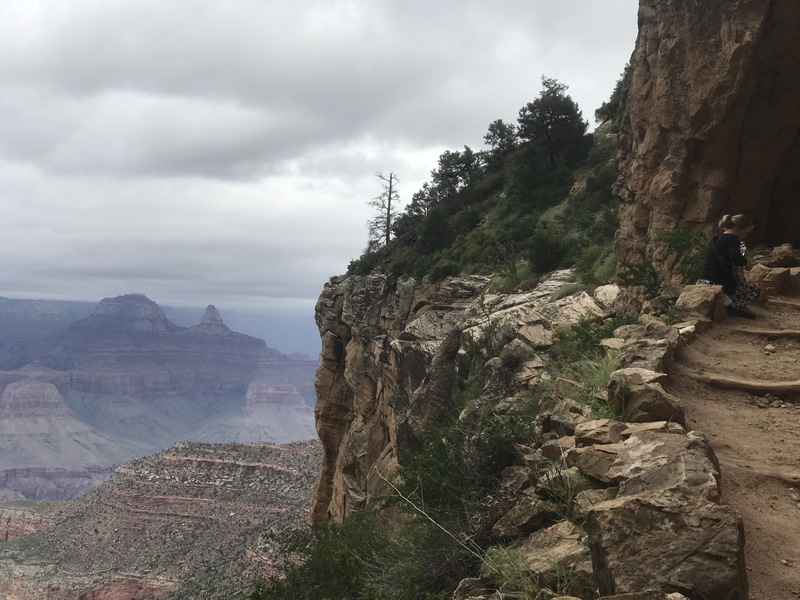 Just after passing Ribbon Falls the trail climbed and I had a great view back down and across to the South Rim. Because of the abundance of water on the north side it is so much more lush and vibrant! Looking back on the greener slopes of the North Rim canyons. Finally to Cottonwood I looked for Bounce and Bonk to congratulate them on finishing the AZT, but it appeared they were already asleep. All eleven sites in the campground are full. I set up camp, made dinner and that was about it for the day. The forecast is calling for the potential for drizzles so I’m playing it safe with the tent. It’s so strange to feel pretty far into the backcountry and yet have potable water pouring out of a faucet. I feel so civilized. Hoping for a dry night.